Hi everyone! I hope that you have been enjoying your summer! I've had a great summer with lots of fun work on both the child and food photography fronts. I will share some of what I've been working on soon. Recently I've shot a couple more cookbooks and am in the midst of working on the photography for a single-subject cookbook on lobster. I'm shooting environmental shots of lobstermen and the like now, and will do the plated dishes next spring when the author finishes the manuscript. I've had some a amazing child/parent clients and some really lovely and touching images that have come out of those sessions. I have a great slate of new work coming up that I'm very excited about. If you are interested, I seem to be doing little updates more frequently on my Facebook site than my blog - please feel free to hop on over there. My family and I just spent 2 weeks in Maine. Both relaxing and enjoying the ocean and the wonderful, quaint towns but conveniently also making some progress on the lobster cookbook. I had the opportunity to meet many lobstermen as a result (and eat many lobsters!). My husband and I were both remarking that it's nice when I have an assignment when we are away because it forces is to interact more with the locals and discover more of the local culture. This time, we certainly were able to do that, and it was wonderful. So what's been up with this blog? Well, I have been wanting to re-brand for some time. I've felt for a while that Cookbook Catchall is a name that no longer really reflects what I'm writing about. I want to include more of my child photography on this site and wanted a broader name. I also wanted a new look and feel and a custom URL. So all of that was accomplished easily enough but when I went to publish my blog, Blogger managed to throw out all of the comments prior to the change. Years of comments from you that I truly value. If I switch back to the Blogspot URL, I get them back. Go back to the custom domain name, and they are gone. I've looked up this issue and it seems it's a known bug with no fix. I'm so frustrated and disillusioned that it's kept me from doing new updates! Does anyone know anything about this? Any ideas? Should I just switch to Wordpress and start all over again? I thought I'd share an outtake from the next issue of Sweet Paul which will be out during the first half of September. I contributed an apple story, and the final recipes ended up being sweet. This one, which is delish, is out so I'm sharing it here - enjoy. Combine crab meat and seasonings. Adjust seasonings to taste. 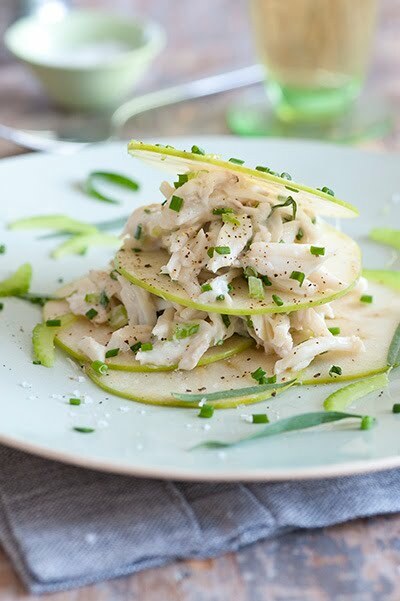 Arrange crab meat in layers between apple slices. Serve immediately. I shot a bunch of long exposures of the clear Maine sky while we were there. This was my favorite. No photoshop here - this is straight out of the camera! The recipe sounds very good - what a nice combination for a summer-lunch! And the night sky looks amazing: Have a lovely evening. I just switched to a custom url and while I am sure I didn't have the numbers of comments that you do mine seem to have made the transition. I can't always say that about the "signature" on my posts. Hopefully the transition is a smooth one for both of us! Awesome blog.. been following for a while now and I love the changes! Love the long exposure night sky shot! Very glad that you're back and looking forward to your new photos and blog posts. And, like the new look of your blog. Clean and simple. Note: I think all of the comments just came back! How odd! Did the Blogger gods hear me? Well, let me not ask questions - I'll just be glad! You are so very talented.I remember talking about you last November when I had dinner with Peter G. (from Australia) out in San Francisco. He said you were just as nice. I'm enjoying your new look. Hard to believe the night sky shot that way at 1st glance. A one-time, "chance shot." Lobsters and crabmeat are the best. Happy we will be getting more in the future. Upscale treat. Your recipe sounds & looks delicious. Your new look is outstanding! Welcome back Sabra! Love the new design and feel of the blog! Can't wait to hear more about your photography and i'm glad you are enjoying the summer break. The crab apple salad looks refreshing and beautiful! I really love your blog and your fantastic photos! Can I ask you what camera and objectives do you use for food-photography? Hi Sabra, welcome back. Great news. Will you share some more information on the cookbooks you have and will work on? Would be great to know in which books one can see your photographs. I like the new name of your blog. And yes it fits much better than your old one, I have to admit that I like the old one very much too, because it was so uniqure and easy to remember. New look is great, and this recipe is really appetizing! Love crab and lobster, wonderful pairing with the apples. 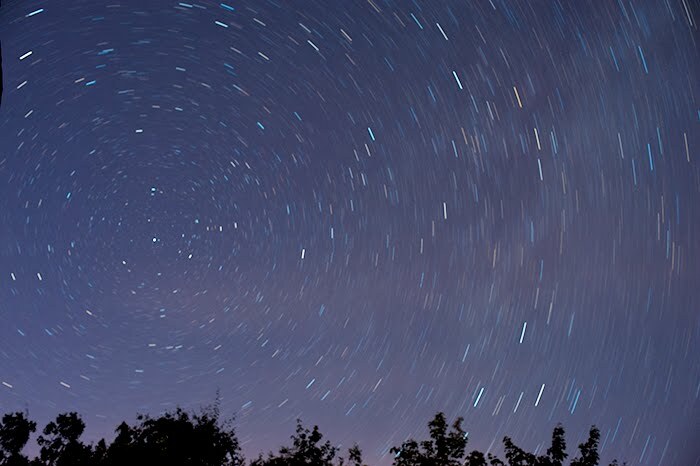 your blog looks great and that is a wonderful capture of the starry sky. you are a talented woman!